Dr. Mathur is double board certified in obesity medicine and pediatrics. 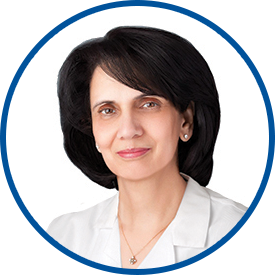 Since 2004, she has focused her attention on treating overweight and underweight children. She received her MBBS degree and MD (Pediatrics) from Moti Lal Neru Medical College in Allahabad, India, followed by her residency in the Department of Pediatrics at Lincoln Hospital in the Bronx. She received her master of public health degree in management and health policy from the Mailman School of Public Health at Columbia University. Most recently, she began her own private practice, the Lifestyle Medicine Center in Stamford, CT, where she focuses on metabolic issues, such as pre-diabetes, lipid disorders, and nutrition issues including obesity, eating disorders and under-nutrition. She founded and managed the highly successful KIDS’ FANS (Kids Fitness and Nutrition Services) program for children at risk for obesity at Stamford Hospital’s Tully Center. Dr. Mathur is also the medical director of the Medical Home Initiative in Southwestern Connecticut and co-chair of the Medical Home Advisory Council for the State of Connecticut. She joined WESTMED Medical Group in October 2016, and is fluent in Spanish and Hindi in addition to English.